More than 200 species of squirrels "fly," climb trees or keep to the ground. These little guys are generally omnivores, eating what's available in their habitat. Their four front teeth don't stop growing, so gnawing on nuts files them to a manageable length. Ground squirrels pack nuts in their mouths for temporary storage. It's easy to understand where the term "squirreled away" comes from. The squirrel is an industrious fellow, known for thinking ahead and setting aside food caches to see him through the winter months. He works hard, foraging for food and transporting it for storage, often burying his finds underground to retrieve later in the winter. Tree squirrels and flying squirrels have to carry their food, but the ground squirrel has an advantage: he's the only squirrel with cheek pouches. 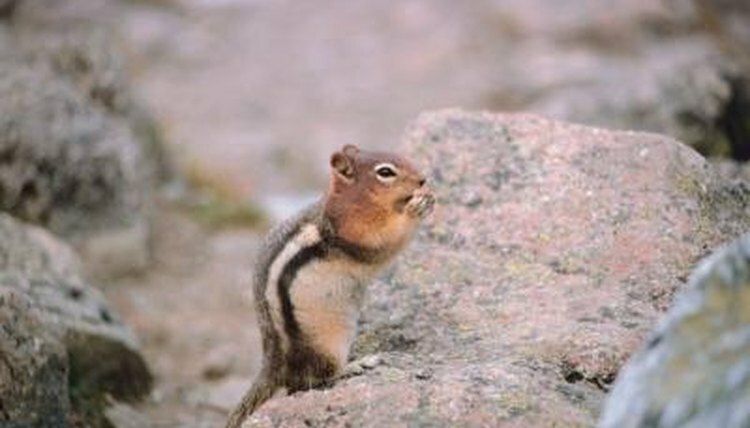 The ground squirrel's cheek pouch is made to hold things, allowing him to pack food in his mouth for easy transport. Unlike the tree squirrel or flying squirrel, the ground squirrel has a muscle that attaches the cheek pouch to his skull, behind his upper incisors. The muscle helps him empty his cheek pouches. The pouches aren't one size fits all, but vary according to species. Think of the ground squirrel's cheek pouches as grocery bags. Though the ground squirrel eats a wide variety of food, he'll pack his "bags" with seeds and nuts for winter storage. Day-to-day, his diet is rounded out with leaves, plants and roots, as well as other animals, such as caterpillars and insects. Frogs, toads and bird eggs are all on the menu, too, though he won't be storing those for the winter. If the weather's warm, the ground squirrel will be out enjoying the day. During the winter, most ground squirrels go into hibernation. The underground burrow system provides a sanctuary for sleep, food storage, safety and raising baby squirrels. The burrows may be as deep as 4 feet below the soil and run as long as 30 feet. Dozens of ground squirrels may live together in a network of burrows. If winter isn't severe, the ground squirrel won't bother with hibernation. If it's too hot out, he may go into estivation, going underground to escape the heat.